I just thought I would show a couple shots from the flowerbed...how do you like my rooster standing back there? He is so big, I had him out in the garage to go to the thrift store--Roger seen him and put him in the flowerbed and had me look. I love him there. He also found this kitty at a yard sale...I forget what we paid for it but sure not much. 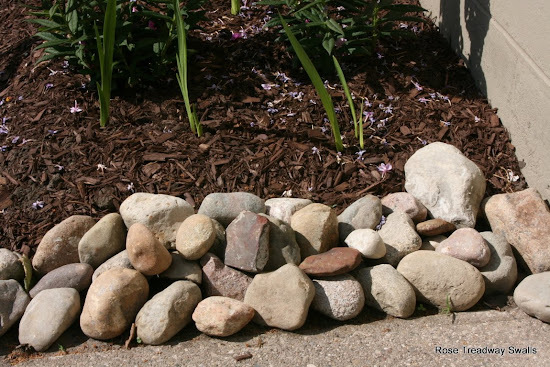 I love rocks...I am thinking about calling a gravel pit and see if I can buy a small load. The ones above have a lot that are smaller than I normally pick up. 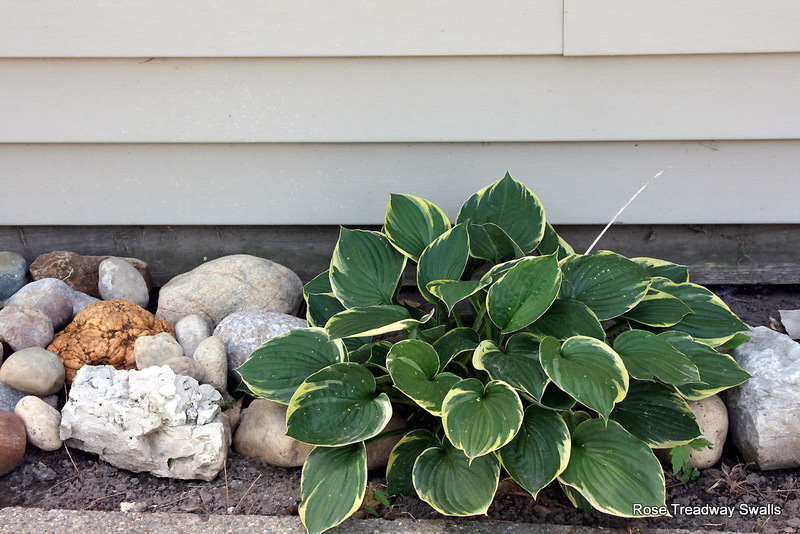 This is the other end of the flowerbed...I want to get enough to go across the front of it also. Now this is not in the new flowerbed...it is out behind the garage. It is not near as huge as my others, but it has done so much better since I put the rocks around it. There you have it...nothing fancy....those are gladiolus bulbs coming up here and there. It was so late in the season when we done this, that they were on sale at Walmart...25 in a bag for $3. I figured if I got three or four good ones I would be happy. Instead I got around 20! Gorgeous flowerbed, Rose. I love the rooster and the kitty. Too bad you all don't live near the Smokies. There's OODLES of rocks like that up there!!! Your flowers are beautiful and Mr. rooster matches them well! So glad you have put him to his intended use! You've got beautiful flower beds. Thanks for sharing them with us. Oh, I see coneflowers, my favorite flower :) Very pretty flower bed Rose. I love the rocks, i really like rocks big and small and tiny. the rooster looks great so does the cat. tell him he done good. 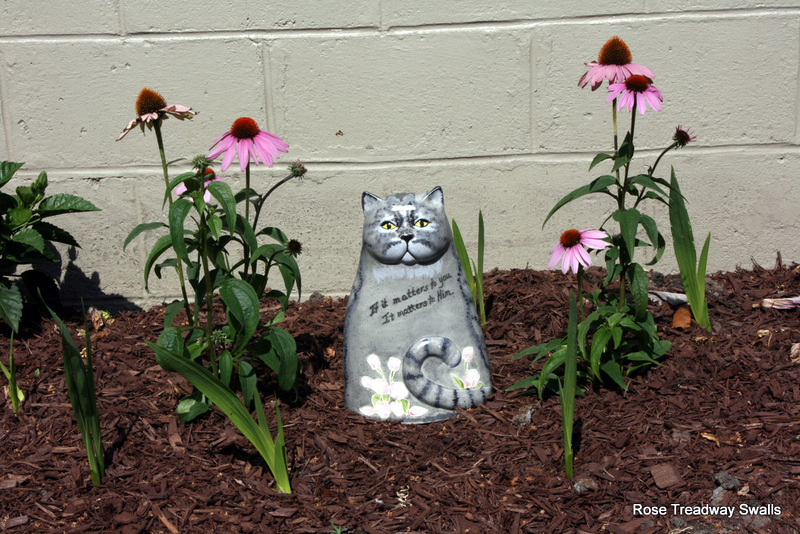 Love both the rooster and kitty...and the flowers are so pretty. Your hard work paid off. Your garden is looking very lovely, the rooster and cat are a great idea. Love the rooster and kitty! They add a lovely little touch of whimsy to your beautiful flowers! 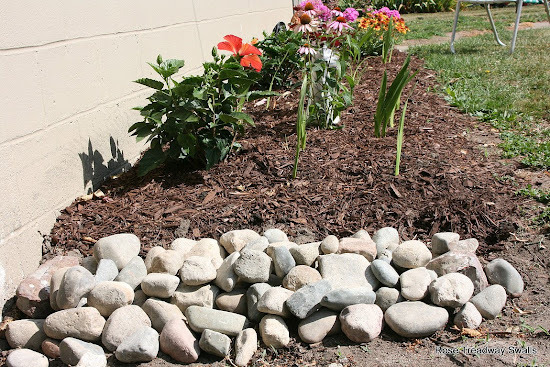 Great flowerbeds! 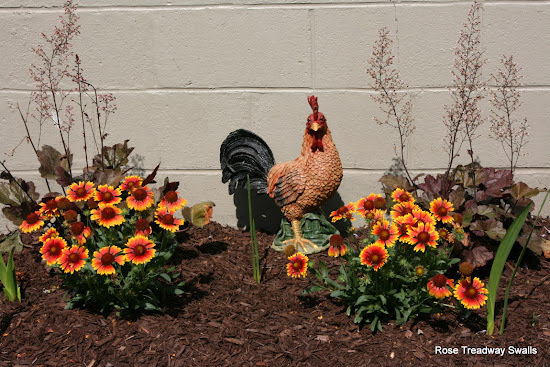 I love the rooster...he matches the flowers in that bed perfectly! Love that Rooster. So colorful! Love the garden, rocks and your garden art. Awesome!